A scene from “Now or Later” at Diversionary Theatre. If you’re feeling a lack of political debate, discussion and ideology in your life, you’ll want to rush to see “Now or Later” at Diversionary Theatre. 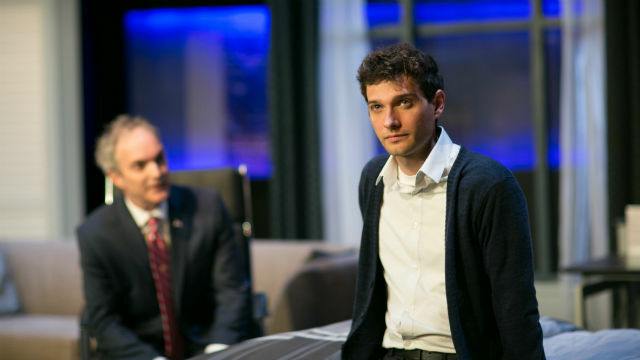 Christopher Shinn’s drama is set on the eve of a Presidential election. Written in 2007, it premiered (and is set) in 2008. But in 2015, the playwright went back and tweaked the piece, updating some of the info on gay marriage. All the other issues he raises in this very talky 70-minute play remain combustible. Freedom of speech, especially on campus, gets a large share of the spotlight. And respect for other religious belief, prophets and iconography, even if those religions conflict with your own conceptions or lifestyle. Tolerating others’ ideas, in other words. And intransigence vs. compromise, both personally and professionally. John (wonderful, engaging J. Tyler Jones) is the privileged son of the President-elect. But for a kid who’s grown up in a political dynasty, he’s incredibly naïve. He thinks he can and should have privacy and autonomy. He thinks he can express and act on his firmest psycho-social-religious beliefs with impunity. His parents, and his father’s campaign posse, think otherwise. When photos of John at an off-campus party surface, he adamantly refuses to back down from his inflammatory position or apologize for his objectionable acts. This is the crux of the piece, and John’s interactions with his icy mother (Lisel Gorell Getz) and surprisingly compassionate father (excellent — especially when angry — Eddie Yaroch) are the most interesting parts of the play. Less so the endless and repetitively didactic disquisitions on Muslim and fundamentalist Christian beliefs (especially about women and gays), and the exigencies of political campaigns and compromises. The other three characters seem unnecessary, just political positions (the characters played by Matt Thompson and Whitney Brianna Thomas) or sounding-boards (John’s fellow Ivy League student, a total cypher portrayed by Joshua Jones). Shinn’s political anger, frustration and righteous indignation have gotten in the way of what could be a solid and provocative play. About a political family. A gaggle of narcissists. An emotionally fragile son with strong and unshakable opinions and a sense of entitlement, with a shocking lack of awareness of the ramifications of his highly charged speech, outbursts and actions. In other words, a politically charged family drama. Strip away all the excess chatter, and there’s something vital and real and compelling here. Matt Morrow has directed effectively. The attractive design (by the gifted and ubiquitous Sean Fanning), an upscale hotel room in a Southern state (which serves to increase the stakes and the anxious environment), along with the costumes (Shirley Pierson) and sound (Blair Nelson) provide potent support to the text. The lighting (Curtis Mueller) is supportive, too — except for the final cue — which is as heavy-handed and sledgehammer-subtle as much of the political dialogue.